Well its 2006, the new year arrived much sooner than expected, time seems to really fly past when you are trying to get things done. But all the best to everybody from the JW leaky boatyard and armchair thinking company. 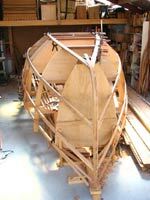 Charlie continues to work away at his boat, right now I can hear my planer busy making large pieces of wood into a pile of shavings as I write, he has been laminating the big “corner “stringers in place. There are eight of these, chine to bottom, chines, fender wale ( a heavy stringer about 10 inches below the gunwale) and the gunwale each side. Getting them fair and in the right plane relative to the frames and each other is fussy work and with three pieces of 20 x 25mm in each its taken him a while, but the increase in rigidity of the framework has to be felt to be believed! He’s busy making and scarfing up the 25 x 45mm intermediate stringers now, notching them into the frames and fairing them up for the planking. It’s a massively strong structure for a 21 ft boat but I’m sure there will be times when he appreciates the strength. The 10mm thick slices will go through my planer to tidy them up and then will be applied two layers thick over the frames and stringers with glue and screws to hold them in place. Charlies just brought a big plastic rubbish bag of shavings out for my wife to mix with her pony poo in the garden, I hope he left enough for the cat to sleep in, he’d be annoyed if his bed was not made! Progress on Resolution has been steady, the tedious part will be over ( for a while) soon and the planking is both straight forward and simple so once that is started there will be a lot of visible progress for a while. I’m sure that the builder is looking forward to that, its nice work, and the chine construction makes the pieces short and easy to lay on. Did I mention that I’ve been to Ullrich Aluminium for stainless screws? About 20% of the price you’d pay at the “yotshop”, I’d suggest that anyone needing a lot of these screws looks in the Yellow Pages for whoever supplies fastenings to the aluminium window joinery industry and find out what it takes ( usually buying packets of 1000 will do it) to buy from there.